Fantastic Social Media Tools for Garage Door Businesses! This week, we invite you to read this great article we found in the Fall 2014 DASMA Insider Magazine. We certainly do appreciate Tom Wadsworth for letting us share. We at Eden Coast can attest to the value of both Facebook and Houzz. Both avenues have been great relationship builders for us. We'd love to hear from you about your experience with Facebook, Houzz or any other Social Media tools you have found helpful to grow new and existing relationships with customers! Although we have provided the article below, you can click on it to view a larger copy at the dasma website. We always invite your insight and experience! Please share in the comment section below! Kristen Bosse of Georgia State Homes was kind enough to do an interview with Brian Clark, our Director of Sales and Marketing in an effort to get to know more about our business and why we do what we do. We have copied a part of the interview here and have included the link where you can read the article in its entirety. Thank you Kristen, for taking the time to get to know about us! Enjoy the article! Can you briefly go over the main options that homeowners need to decide on when they're considering a new custom garage door? Can I have any design I want? Would I like to add windows to one or more sections? Can I have any color that I want? Can I match a wood that I like or that is already on my house? What level of insulation is appropriate? What are some of the most popular garage door styles and features for most homes? In terms of style, customization is what distinguishes us from the rest. Our attention to detail and dedication to quality are the cornerstones of our success. We do have some designs that are requested more frequently than others, but when it comes to a custom composite door, the design and finish are as individual as the owners and their homes. As for features, you may wish to incorporate windows into your door or embellish the door with some decorative hardware. It's totally dependent on your vision. How well do your garage doors stand up to the environment? We have a large number of our doors installed in Florida. That is one of the harshest environments anywhere with its extreme heat, humidity and coastal exposures. The main advantage of using composite materials to clad the door is that it is fully customizable and it is a better alternative than wood. The composites we use will not rot or decay. The finishes we apply, be it paint or stain, are from the highest quality manufacturers and are designed to stand up to all temperatures and harmful UV rays. 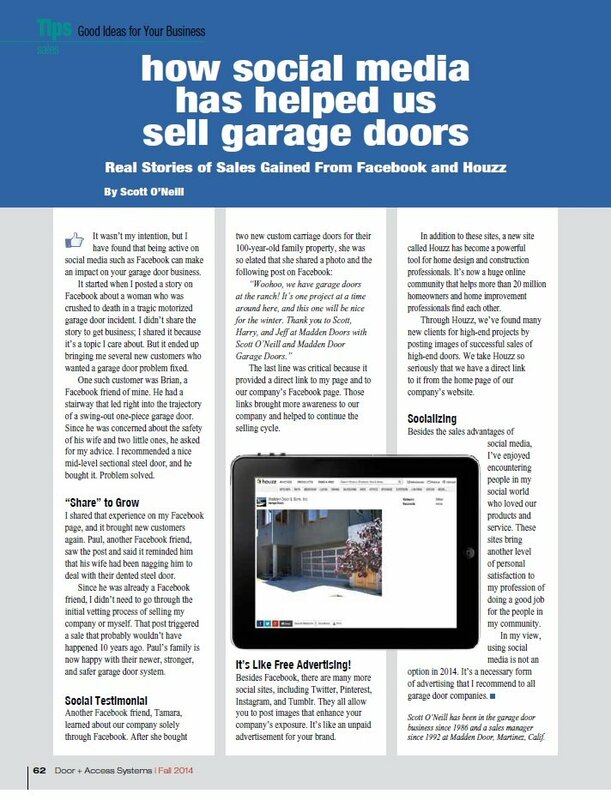 Check out my interview, 7 Tips on Custom Composite Garage Doors on Georgia State Homes, one of the top sites for Georgia homes for sale, including Douglasville, GA homes for sale. Georgia State Homes also services Florida real estate and North Carolina homes for sale. Here’s the scenario: You’re at a sales appointment and the customer says “I want to put a car lift in my garage to store another vehicle and I need the door to go up as close to the ceiling as possible.” They go on to ask for specific dimensions and clearances, but you’re not really sure about how it will all come together. Here are a few tips I’ve gathered to help clarify high-lift issues. First, let’s define what high-lift is. 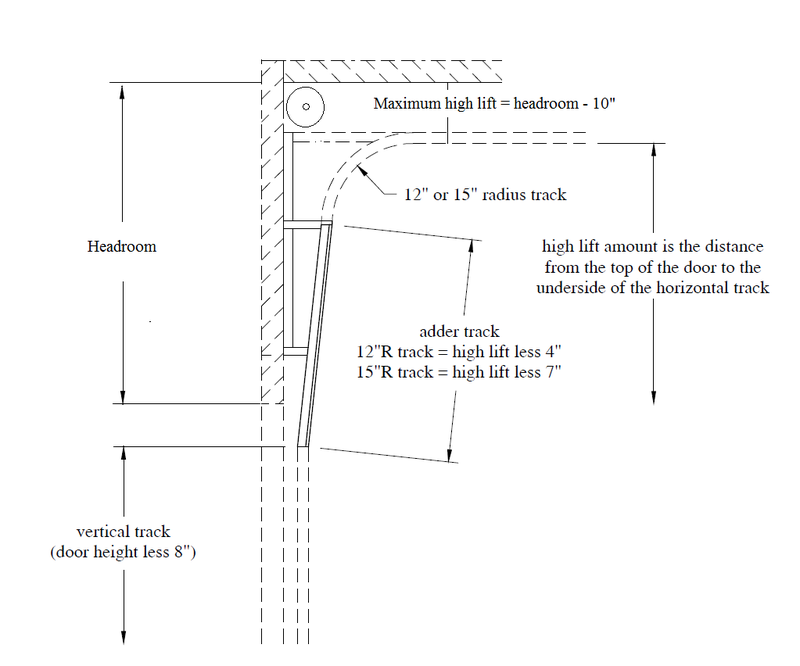 Simply put, high lift is the difference between the height of the door and the bottom of the horizontal tracks. This means the headroom is 48"
The maximum high lift would be 48"-10" or 38". (The 10"deducted is the space needed for the horizontal track (2") plus the drums and end bearings). I hope this helps the next time you need to figure a high lift job. Many thanks to C.H.I Overhead Doors for the majority of the drawing. Please feel free to download our Headroom Requirements Worksheet for your use. If you have any tips and tricks you would like to share, feel free to email me at brian@edencoast.com. As always, we encourage your comments or suggestions in the section below. Thank you! In an effort to share with you some of the many outstanding garage door dealers in the country, I would like to introduce a recurring segment on our blog: The Dealer Spotlight. Allied Doors West Florida, Inc.
Allied Doors West Florida, Inc. has been serving Southwest Florida’s garage door needs since 1991. We are a family owned and operated business who specializes in garage doors, garage door openers and garage door repairs. Allied Doors West Florida, Inc. is one of the largest sellers of garage doors and garage door openers in Southwest Florida, and our commitment to customer service is unsurpassed. We proudly offer Amarr, C.H.I. and Eden Coast doors and are a LiftMaster ProVantage dealer. We furnish and install doors rated for all wind code areas including Miami-Dade. In addition to our dedication to customer satisfaction, Allied Doors West Florida, Inc. is also committed to our community. We have installed many garage doors for Habitat for Humanity in Lee and Collier Counties and also contribute to various local charities such as Builders Care, KidsCan and Naples Equestrian Challenge. Our business is fully licensed and insured and all of our technicians are full-time employees. Our highly trained and qualified staff is dedicated to superior standards of product installation, service, and dependability. From quality steel garage doors to custom made wood and composite garage doors we are a one stop shop. Because change and innovation are constant, Allied Doors West Florida, Inc. strives for consistent improvements in policy, procedures and technology to promote continuous growth toward new levels of excellence. Our showroom is “second to none” and a good example of this principle. If you’re unfamiliar with Allied Doors West Florida, Inc., take a few moments to surf over to their site. They are extremely knowledgeable and a fine example of a quality garage door dealer. From time to time I like to pass along information I have discovered which I find particularly useful and informative. 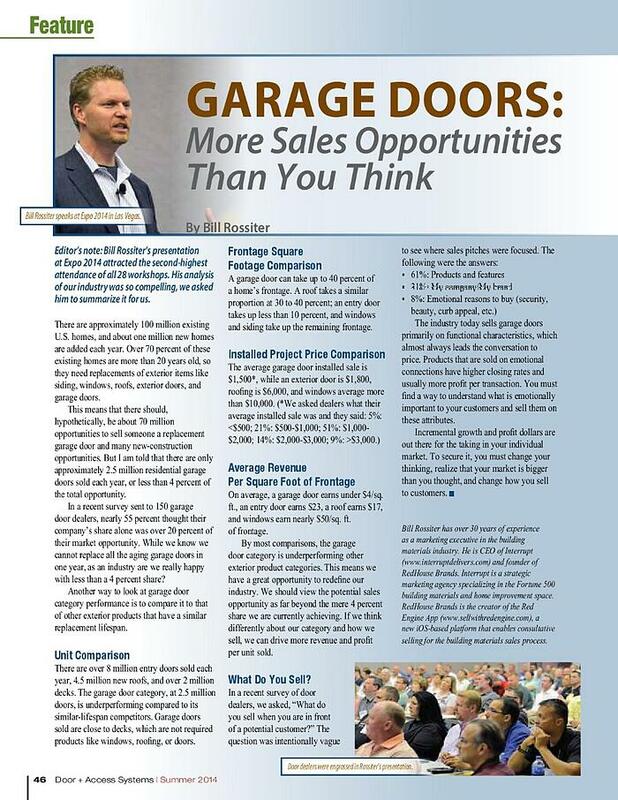 The following is an article from DASMA’s Door and Access Systems Insider eNewsletter. Many thanks to editor Tom Wadsworth for allowing me to share it. As always, we encourage your comments or suggestions on this topic in the section below. Need Help Choosing the Best Garage Door Dealer for You? When you’re in the market for a new garage door, choosing a good dealer is as equally important as the door you choose. Garage doors are large, heavy, potentially dangerous moving objects which require a level of skill and training to install and service. If you are a builder and the project is new construction, you may have a dealer (or two) that you work with and trust to do your work. If you’re a homeowner and replacing your existing door, the choice is all yours. In either case, here are a few things for you to consider when choosing a garage door dealer. Talk to your friends and neighbors. Who have they used in the past? Did they have a good experience with the dealer? Why or why not? Speak with a couple of reputable builders in the area. Get their input on the subject. If the builder says they use them because “they’re the cheapest”, move on to another builder. Do an internet search for reviews of garage door dealers. Skip the paid ads. The results should include numerous reviews from sites such as Yelp, Angie’s List, YP, BBB, etc. PLEASE remember that anyone can write anything on the internet. If you read a poor review, continue reading to see if the dealer has responded, commented or proposed a resolution to the customer’s poor review. Is the company familiar with local building codes and regulations? Do you live in an area that they service on a regular basis? Longevity is typically a good indicator of a well-managed service company. That doesn’t mean that this should be your only tool in measuring quality. Maybe they have just been doing average work for a long time. There are many newly formed companies who bring a great level of enthusiasm, technical skill and customer satisfaction to the marketplace. Regulations regarding licensure of garage door dealers vary greatly across the country. But where it is required, some organizations will conduct business without proper licensing, insurance or both. Ask to see copies of the documents required to conduct business in your area. If you live in an area that requires building permits to change your garage door, the dealer may not be able to pull the required permits if they are not properly licensed or insured. Are they members of any professional organizations? Professional organizations such as IDA (International Door Association) strive to create and maintain quality and professionalism as well as provide helpful programs and services to their door and access system dealer members. There are also regional and local associations which foster these same values on a more local level. Is the dealer “married” to a particular brand of door? If their manufacturer doesn’t offer what you want, is the dealer willing to step outside their preferred product line, put your needs first and seek out the best products for you? Sometimes this requires extra effort on the part of the dealer to do some homework, but his willingness to address your specific needs speaks to his overall level of customer service. Don’t settle for being pigeonholed into a “cookie cutter” product. Does the dealer service what they sell? Make sure the dealer is willing to stand behind his products and workmanship. 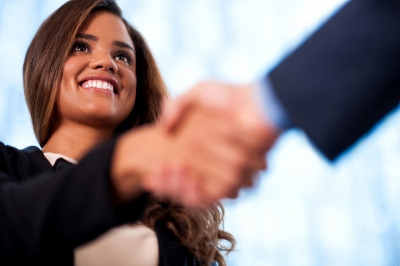 As you speak with representatives from different dealers, take note of their general level of professionalism. Are you being treated respectfully? Is the dealer using a consultative approach and attempting to educate you on your options, or is he/she using high pressure tactics? Take the time to do a “gut check” and find a dealer with whom you can comfortably relate. I always welcome additional comments or ideas via the comment section below. We all benefit from sharing our individual experiences.